Marvel's Guardians of the Galaxy has been growing in popularity over the last couple of years since it got the big screen treatment. Whether you are looking for ideas for group costumes to coordinate with your friends for Halloween or a cool solo costume, consider dressing up like these heroes and villains. Star-Lord is the dynamic half-alien, half-human fearless leader of the Guardians. You can buy a fully equipped Star-Lord costume that's officially licensed by Marvel, or put together your own as described below. Put on a basic, long-sleeved black shirt. Choose a red vinyl jacket to serve as your Guardian jacket. Put on black socks and black boots. 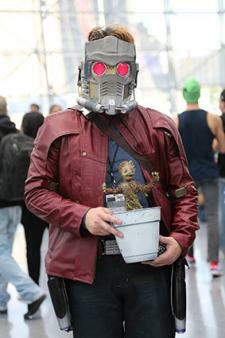 Put on the Star-Lord helmet. Purchase a Sony TPS-L2 Walkman or print out the image of the Walkman and tape to your jacket. Known as the most dangerous woman in the universe, Gamora is a strong character. She travels among the Guardians and has a lot of power. Thanks to her unusual look, complete with green skin and purple hair, this is a really fun costume to wear. You can buy an official Gamora costume or make your own. Use a makeup sponge to generously apply green body makeup to your face and neck. If your shoulders will be exposed in the costume you've chosen, apply the makeup there as well. Let it dry, then reapply it. Put on your black ensemble. Feel free to get a bit creative here, or you can improvise with some all-black flirty clothes that you have. Generally, try to stick with black, form-fitting pants, black shoes, and a black vest. Highlight the eyes with green eyeshadow. Use a silver eyeliner to draw two lines above each eye, three lines joined on each cheek, and other lines on the forehead like the character has. Put on a purple wig. There is an official Gamora wig that you can purchase, or opt to try out another type of colorful wig that fits your interpretation of the character. Because body makeup is likely to come off of your hands with frequent use throughout the evening, it's easier to put on green gloves than reapply body makeup to the hands all night. This character memorably repeats, "I Am Groot!" Also known as the Monarch of Planet X, Groot is a tree-like creature, and this costume will be instantly recognizable to anyone who has seen Guardians of the Galaxy film or read the comics. You can purchase a Groot costume for children or adults. If you're feeling creative and want to make the costume yourself, try the following steps. Purchase a Groot mask. While there are very involved methods for crafting a Groot mask yourself, the process is time-consuming and about as pricey as simply purchasing the ready-made mask. Place the brown full body suit on a flat surface. Use a black fabric pen to draw lines on the body suit to replicate the bark, limbs, and other physical imperfections of a tree that would be suitable for Groot. Keep in mind that trees have shapes and lines that may change directions abruptly, so you're not seeking perfection here. Do this all over the body suit from the top to the bottom. If you are not comfortable with the form-fitting body suit, you may do the same with a brown shirt that you wear over the body suit. Be sure to draw the black lines in a way that will look natural when the shirt is worn over the suit. Also bring out brown latex gloves and draw similar black lines on them. Alternately, buy specifically designed Groot gloves. If you'd like to do the same for brown gloves and shoes, you may use the fabric pen to draw on them as well, or simply wear brown shoes and socks that don't stand out or otherwise distract from your costume. With heightened senses of sight and smell, Rocket Raccoon is a prominent superhero that is part of the Guardians, and he is a talented military tactician. Due to the complex nature of this animal costume and its relatively low price, you may want to purchase an official Rocket Raccoon costume. If you'd rather do it DIY-style, try the following instructions to make your own Rocket Raccoon costume. Put on a form-fitting faux fur jacket. Cut the arms out of an orange space suit. Sew or pin a faux fur tail to the back of your orange space suit. Put the orange space suit on over the faux fur coat. Put on a pair of black gloves to serve as the paws. Make up your face to look like Rocket Raccoon. Apply gray makeup to the forehead and as an overall base for your face. Make sure to apply white face paint over eyebrows and the entire top area above the eyes. Next, apply black eye shadow around your eyes to create Rocket's "mask" and black face paint to your cheeks. You may choose to draw whiskers on your face as well. Alternatively, put on a raccoon mask. Put on gray socks and slipper shoes. These should be a small part of the costume as they should simply provide comfort and allow you to complete the look without a lot of fuss. As a super human warrior, Drax the Destroyer aims to defeat the Titan. 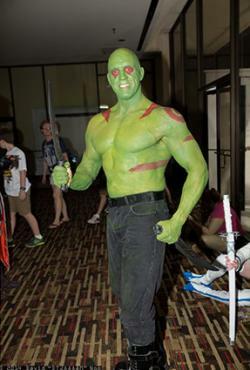 You may opt to buy the official Drax the Destroyer costume. (There's even option for kids!) However, if you'd rather pull it together yourself, plenty of creative options abound. With an official Drax the Destroyer Makeup Kit to help you create the unique face of this character, you can soon be well on your way to an authentic-looking costume. Put on a gray bald cap. Alternately, shave your head and use gray body paint to color the head. Apply makeup from the Drax the Destroyer Kit makeup kit according to the instruction on the package. If you have a muscular build, you may opt to use body paint in a gray-green color all over your neck, chest, and arms. From there, draw patterns with red paint that is in keeping with the designs on the character's body. If you don't want to go without your shirt, purchase a gray-green t-shirt and use red fabric paint to create the appropriate designs. Put on a pair of figure-hugging black pants, a pair of black socks, and black lace-up shoes. Carry a prop knife in each hand to complete the costume. As a Kree, admiral of Thanos, Ronan the Accuser is the central enemy and antagonist of the Guardians. 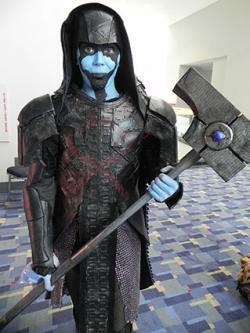 Creating a Ronan the Accuser costume is somewhat time consuming but relatively easy to do. You may cut out the makeup steps by simply buying a Ronan the Accuser face mask, or follow the full instructions below. Use a sponge to apply blue face makeup to the entire face and neck area. Let it dry for 10 minutes or as long as the instructions or makeup recommend, then apply a second layer. Put on black makeup around the mouth area, chin, forehead, and around both eyes. It should be a layer on top of the blue makeup. This doesn't have to perfect. In fact, more rugged lines will be more like the look of the villain in the film. Apply black eyeliner and mascara to make the eyes stand out amidst the blue makeup. Apply black lipstick to the lips to continue the black aspect of the face to the lips as well. You may need to layer this or bring along the lipstick for reapplication throughout the night. Put on a black skull cap that reaches over your forehead. Glue a black cloth that reaches each shoulder over the skull cap to create the black headdress of Ronan. Put on a pair of blue latex gloves to create the blue hands of Ronan. Wear a black shirt with shoulder pads. Put on a long, loose black jacket to serve as the armor. Wear black, form-fitting vinyl pants. Put on black socks and black dress shoes. If you really want to be authentic, wear purple contact lenses. Spray paint a hammer silver. Watch the film again or check out the trailer if you want to be sure your costume looks authentic. 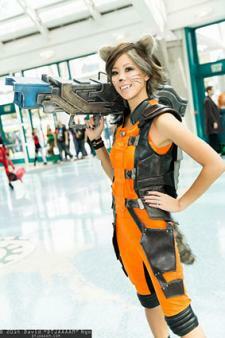 Show off your costume at your next cosplay event or Halloween party.